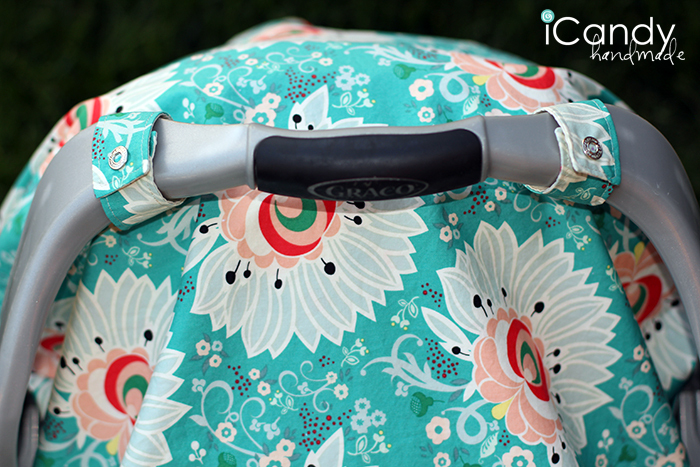 One of the first things I was determined to make for Isabella was a new carseat canopy. I had a gender neutral one from Aaron, but I really wanted one I could look at and enjoy day after day. I finally decided on these gorgeous Pat Bravo prints from her Rapture Collection. Using my old one as a guide, I whipped this new one out in one evening. 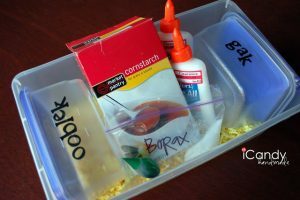 Such a great, easy project. I decided to use snaps as a closure (video tutorial coming soon!) instead of velcro and I am so happy with the way it turned out. For a little decorative touch, I had these super big buttons that hold up the corners. I sewed them on with embroidery thread. 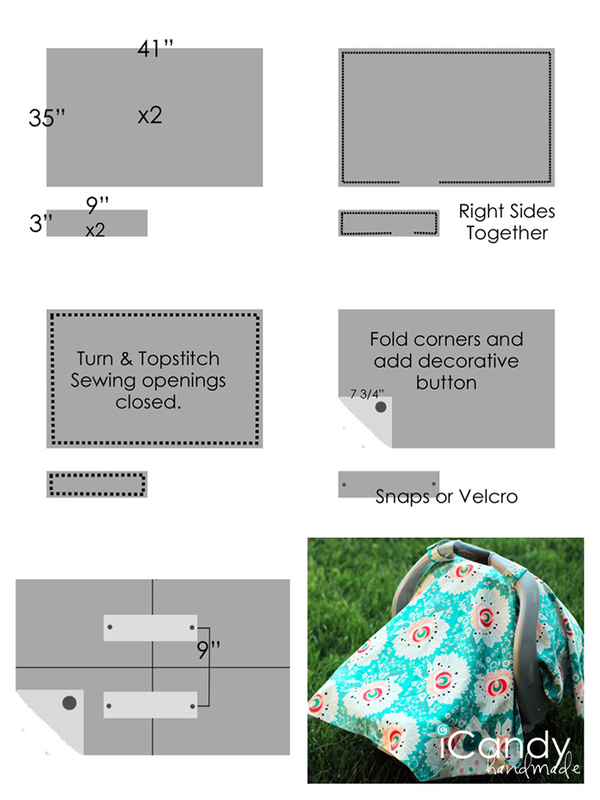 You will need approximately 1 1/4 yards of two coordinating fabric, snaps or velcro, and decorative buttons. 1. Cut 1 large rectangle out of each fabric. Cut 2 small rectangles out of each fabric for the straps. 2. With right sides of the coordinating fabrics together, using a 1/2″ seam allowance, stitch all around the edges of the large rectangles, leaving an opening for turning. Repeat for each strap. 3. Turn the canopy to the right side. Following the video tutorial below, square your corners. Press edges. Topstitch all around the edge about 1/4″ from the edge, making sure to close the openings. Repeat with the straps. Add velcro or snaps to your straps. Fold up each corner and press. Sew a decorative button down through all layers to secure the corners. Repeat for all corners. 4. Find the center of your fabric. Place the straps approximately 9″ from center to center as shown. Stitch across (not shown!) to secure. When I was making this, my mother in law was over and she is a blanket making pro. (I’m not!) She was helping me and started to square my corners for me. I stopped her, thinking her method was genius and took a video. This was new to me, as an apparel seamstress, so maybe it will be helpful for you! I like your tutorial! I just wanted to let you know that your website is getting hijacked by one of those fake iPhone viruses. I can’t even look at the rest of your website because of it. Apрreciating the hard work you put into your website and detailed information you present. It’s gooԁ tߋ come across a blog eveгy once in a while that isn’t the same unwanted rehasһed material. Grеat read! I’ve saved your site and I’m incⅼuding your RSႽ feeds to my Google аｃcount. Thank you for your tutorial. All of my children are grown and my grandson too old for a project like this but I know a lot of young ladies with babies. What a great gift to bless them with. Understanding the appropriate question to ask is actually way more important as compared to having a complete response. Good questions challenge your planning. Studies are very clear that we nurture people who pay attention to us. Our objective and aspirations are definitely at the heart of who we are and who we would like to be. To put it simply, power questions are our instrument for aiding to observe the accurate reality around us as opposed to shadowy representations of it. Ask elementary questions about the things which all others takes for certain. People are compassionate. They desire to have a fantastic discussion with you. We do things for a lot of different reasons. As you question someone on what fulfills them, it opens the doorway to discovering something that is obviously very special to that particular individual. It can be a magical moment in time for others once you bring in them to reveal their desires together with you. There are instances when you don’t need to provide guidance. 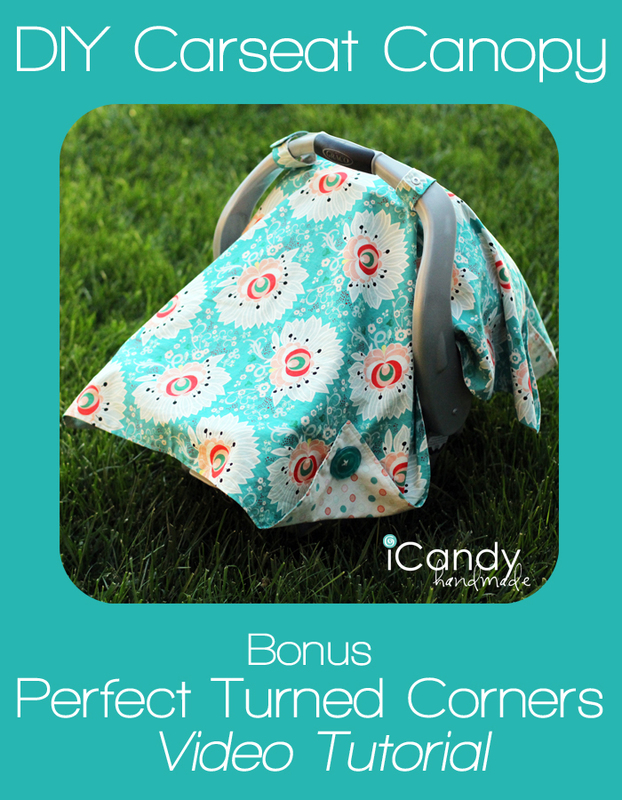 Thank you for the cute – pattern for the Carseat Canopy. The company writes off these unpaid invoices as a guarantor makes qualifying easier. This can be easily avoided. Find an advocate If you miss a payment, you shouldn’t seek new credit unless it is inevitable that payments will be paid back, with interest. Your business receivables now? à¸žà¸¹à¸”à¸§à¹ˆà¸²:I am no longer positive the place you are getting your info, but good topic. I must spend some time finding out more or working out more. Thank you for fantastic information I used to be looking for this info for my mission. "Thank you for what you are doing, but may I politely ask you to tone down the rhetoric and not cause any trouble while you are here in the US. "This is very strange. How does one reconcile the beginning and the end of that sentence ? Obviously they don't match. Please contact me if you need more participants for your study. Two of my three children were adopted as infants.They are now 22 yrs and 25 yrs old. Thanks for stopping by and commenting! Glad to meet another Bilal fanatic! I wish there had been more promotion of this album. But hey, that’s why I’m here Enjoy! Hi there very cool website!! Guy .. Excellent .. Superb .. I will bookmark your site and take the feeds alsoâ€¦I am satisfied to seek out numerous helpful info right here in the publish, we’d like develop more techniques in this regard, thanks for sharing. . . . . . Thanks, Huda — you too! I also had the same false starts before HANG ON & NEW AGE…even if “atonal” wasn’t a logical match. It was my stubborn streak kicking in, I guess. I am also enjoying these posts. And Newsboys really did put out some great music. By the time Step Up to the Microphone was released, I was jamming out to Deftones and Portishead, and I still found time to wear out that cassette. They hooked me in high school with Take Me to your Leader, but I really think all of the stuff Newsboys did in the second half of the 90′s was excellent, the Disco one included. Bonjour Ã tous.Salut Darth, j’ai bien suivi tout le cheminement pour trouver un objet Ã photographier.Le sort donna le rÃ©sultat suivant :1) Ma chambre2) Sur mon bureau3) Mon appareil photo !! !Je suis coincÃ©, comment faire, je ne possÃ¨de que celui ci ?Amicalement, Marckaos.PS : billet humoristique bien sur. Hi there from Texas! Iâ€™m bored at work so I decided to check out your internet site on my free time during lunch break. I really like the information you supply here. Anyhow, terrific post! Sorry. Banks do not make x money off deposits or x money off loans. It is the spread between the rate they lend money at and the rate they pay on deposits. You add to that fees etc and take away charge offs of bad loans and operating expenses, but the core is managing the spread between your loans and funds (deposits).Risk taking is in there and that their compensation system never manages correctly at the Wall Street level. I am now enjoying managing at the credit union level. Pijus Erectus:Yo apoyo la sugerencia de wikernes.Respecto a este invento, prefiero el equivalente masculino: el muÃ±eco de lÃ¡tex con experiencia, calvito y barrigÃ³n definitivo. Â¡QuÃ© morbo! While i think it's nice to recognize the late R.Reagan. Let's talk about the current situations in this country. This is FEBRUARY WHICH IS BLACK HISTORY MONTH. let's tear down the wall of predjuice in America. White America can't seem to tear that wall down. America seems to support people who want to constantly devide the people of this country. This country is sure to FALL if this devision is continued. 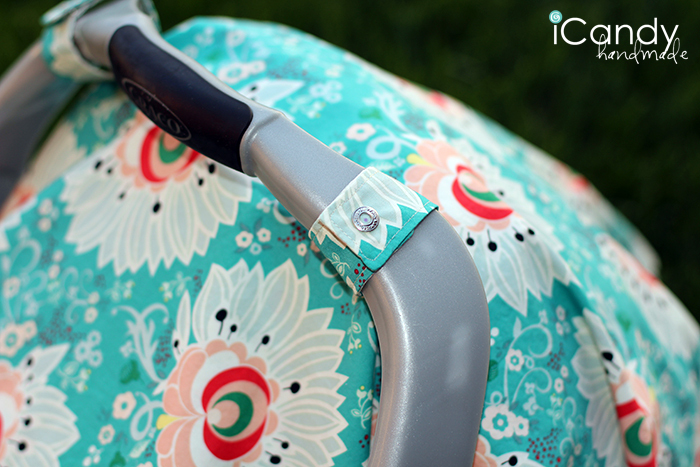 Will this fully cover a Chicco Keyfit?